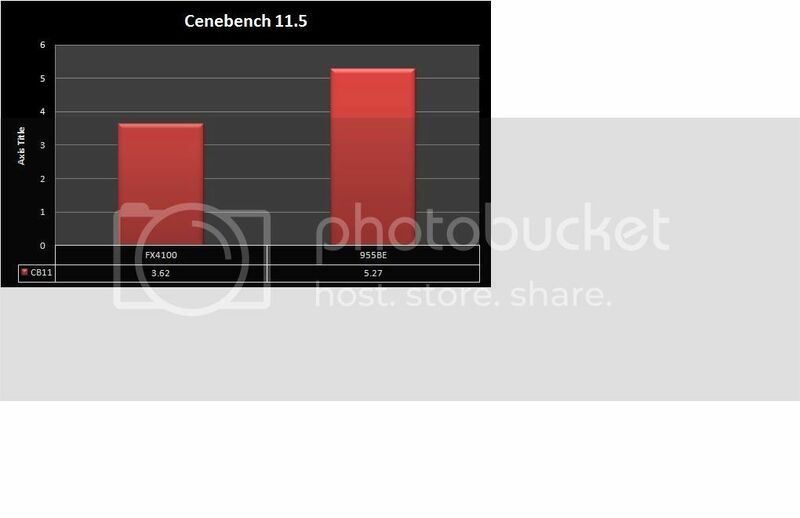 I havenâ€™t seen any results here at XS for the FX4100 X4 so as I do own one I thought Iâ€™d post some bench test results. I figured while I was at it I would do a compare with a 955Be. I was hoping to match the processors clock for clock but the 955Be couldnâ€™t quite finish wPrime 1024 at the clocks I had tested the FX4100 (4.5GHz). Anyway the 955Be did run all the tests @4446MHz so I called that close enough for now. 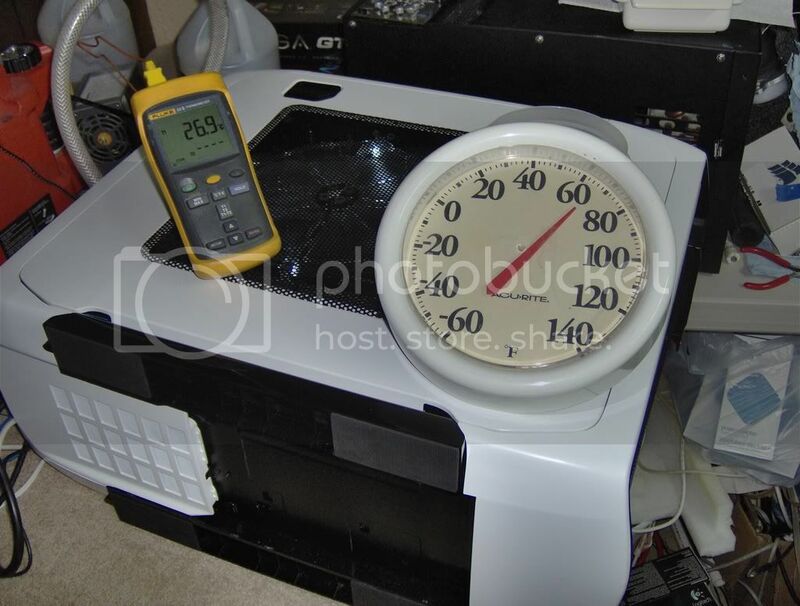 These tests were completed using ambient water cooling (68-70F air temp) with the system installed inside a Corsair 600T case. Before anyone asks no it wonâ€™t run prime95 for any great length of time either with the cover on or off but it will run all the tests shown with the cover (side door) on or off. I tested with the case on its side in order to gain the weight of the pot on the CPU and also to help keep it flat on the CPU lid in order to maintain good contact. I does run fine when the case is vertical or in its normal orientation but as I said I didnâ€™t test in that orientation. These are my results, your results my vary. The FX4100 clocks/settings were set as shown in the photo below. 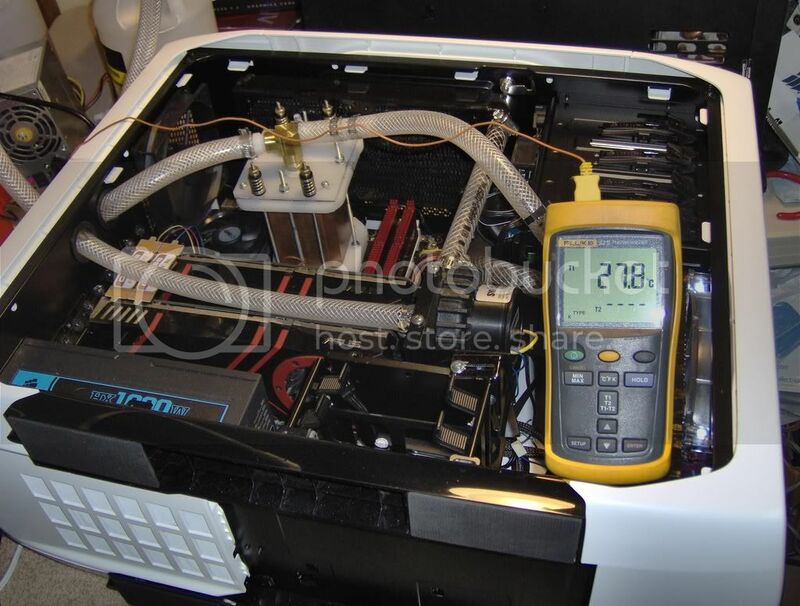 Open case photo (pretest) of the system showing the Fluke temperature reading at idle (the fluke probe is installed in the bottom of the F1 pot as normal). 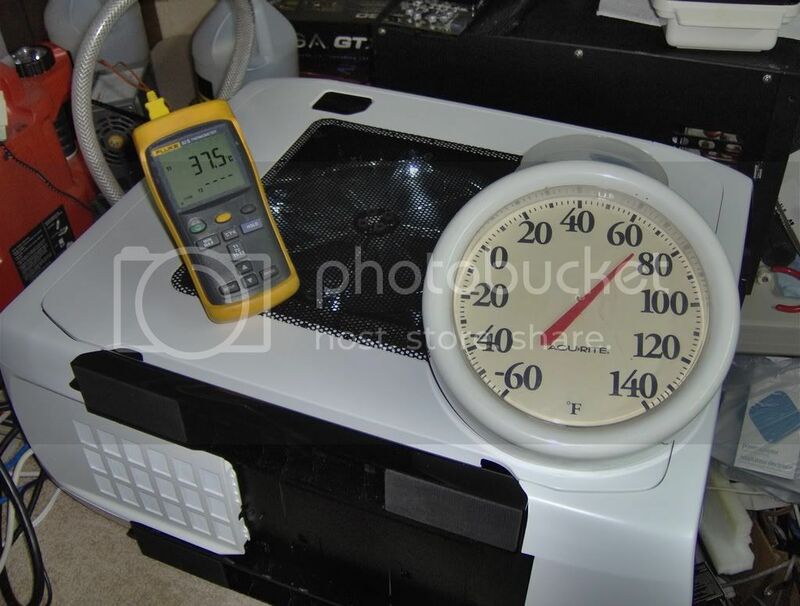 Closed case photo 955Be (pretest of wPrime 1024) of the system showing the Fluke temperature reading at idle plus a ambient air thermometer (sorry but it reads in Fahrenheit). Closed case photo 955Be (post test of wPrime 1024) of the system showing the Fluke temperature reading at full load plus the ambient air thermometer. SS of 955Be systems temperatures/volts at the moment of the wPrime 1024 test completion. not real favorable for fx4100 , seems almost comparable to a phenomI 9850 . i need to compare against my old scores. how high could you clock it though? Last edited by equinox1; 10-20-2011 at 12:02 PM. 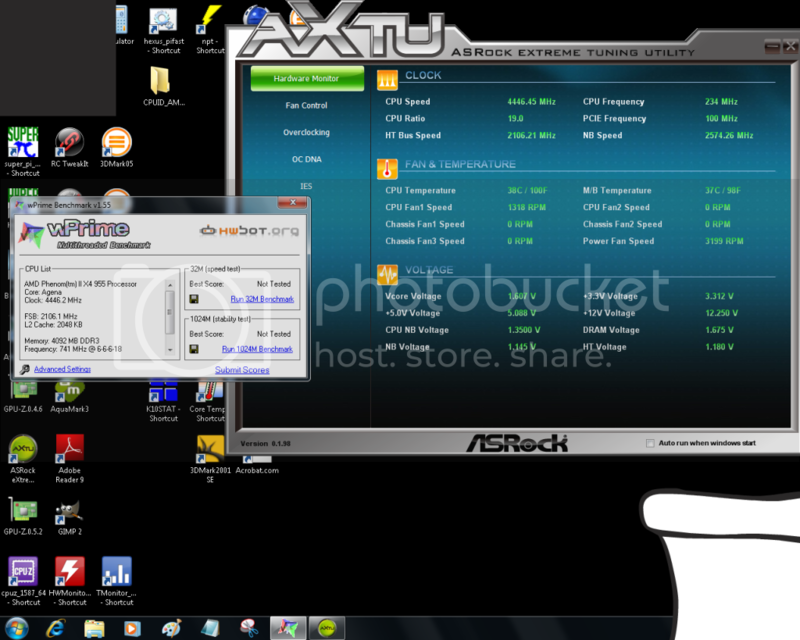 AMD has really dropped the ball..
it is clocked 1300 mhz lower than the 4100 and still beats it by almost 100 seconds. Last edited by equinox1; 10-20-2011 at 12:28 PM. Well, if amd marketed them as 2xxx,3xxx and 4xxx, while naming them as 2,3,4 module/CU cpus without mention to "cores", then maybe, and just maybe, reviews could be a little more positive. Having the 2CU/4C maketed as a 4 core, while slower than their older true 4 cores, and an 8 core striving against the older 6 core wasn't a good choice if performance didn't scale as the name implies. Even if they'd lose the chance to claim the first 8 core desktop cpu. If one compares a 4CU 8150 to a X4 980, things can look a tad better in the sense of an improvement. Last edited by Calathea; 10-20-2011 at 12:38 PM. EQ I clocked this FX4100 to 4950MHz in this same system but it took more vcore than I wanted to use during the early testing. If I remember correctly it wouldnâ€™t finish wPrime 1024 at that clock speed though. FLanK3r this is shot of the box top so they are marketing the FX4100 as an X4. 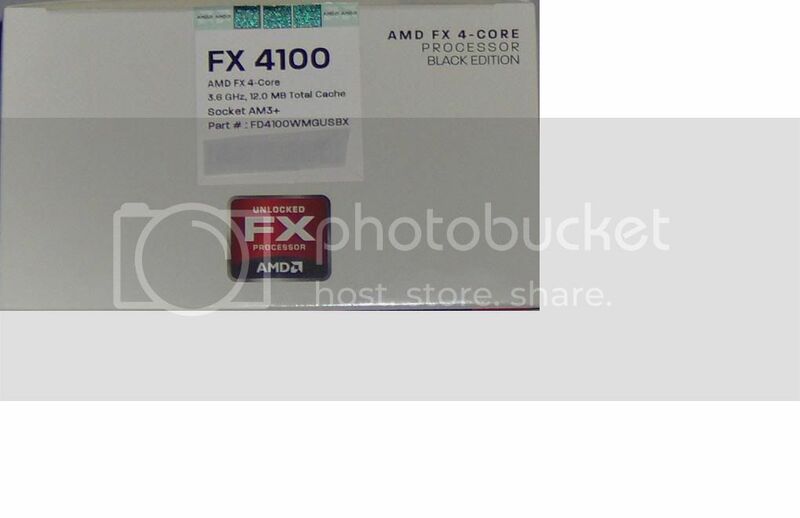 Fact is I like the FX4100. Clock for clock it runs a lot cooler than the 955Be. So far in everyday use (normal tasks) it feels fast. TBH I havenâ€™t tested it as a real world gamers build so? Does it really take 1.5v for 4.5 stable? Would of thought these would clock higher Can you crank the ram up to 2200ish and try again? FlanK3r has attempted damage control as much as possible, however some attempts are failing. It's great vs i3 2100 series because you can overclock it so much, I'd take it in a heartbeat over i3. However vs AMD's old quad it (was, is, and will be easy to see) more than disappoints. This is coming from what I learned from Aaron Schradin over facebook. I believe chew* has the only or one of the only two tops for his "phantom" base. Last edited by BeepBeep2; 10-20-2011 at 02:52 PM. Can you try to unlock modules/Cores on FX-4100? 1.45v set in the bios LLC at Â½ but yes thatâ€™s what it needed because when I lowered either setting it crashed out in wPrime 1024. Iâ€™ve notice that the vcore as read from the ASRock tuning utility is different from test to test so who knows how much vcore is really going through it. The idea of the test was to compare the old and the new head to head clock for clock or as close as I could get. I ran a bunch of different bench tests trying not to favor one processor over the other. Do you think the tests were somehow unfair toward one or the other processor? Beep maybe you donâ€™t care how the processor box is labeled but most people depend on the labeling to determine what theyâ€™re buying. I'll try it as soon as I get the FX reinstalled, maybe tomorrow? Beep maybe you don’t care how the processor box is labeled but most people depend on the labeling to determine what they’re buying. 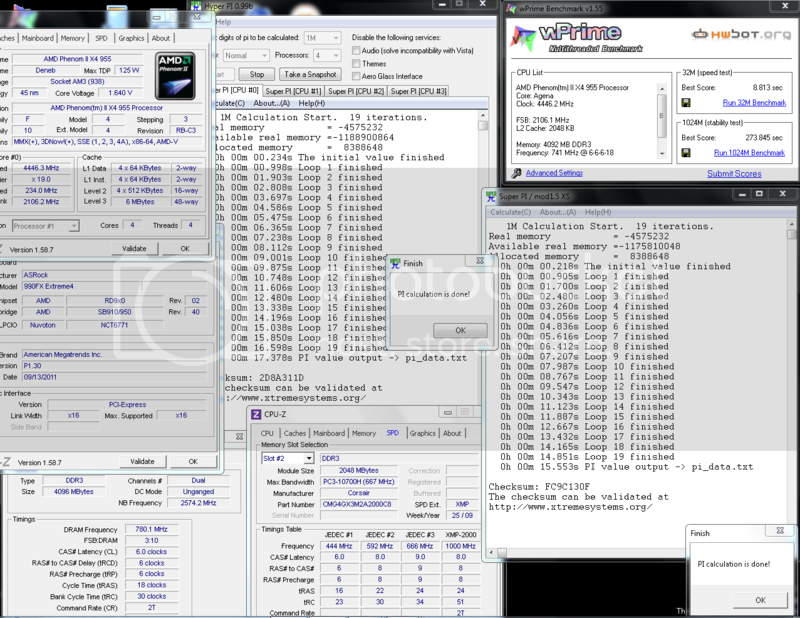 "Cinebench score is higher overclocked than Thuban" ...then it turned into stuff like "Who uses Cinebench or even Excel, use real programs like Handbrake...and look at Tom's Hardware at the ABBYY FineReader result, and WinRAR result, everyone uses that!" Personally I prefer 7-Zip + FilZip combo, but thats just me. The only thing I care about right now is gaming performance, which lacks. 1.45v set in the bios LLC at Â½ but yes that’s what it needed because when I lowered either setting it crashed out in wPrime 1024. 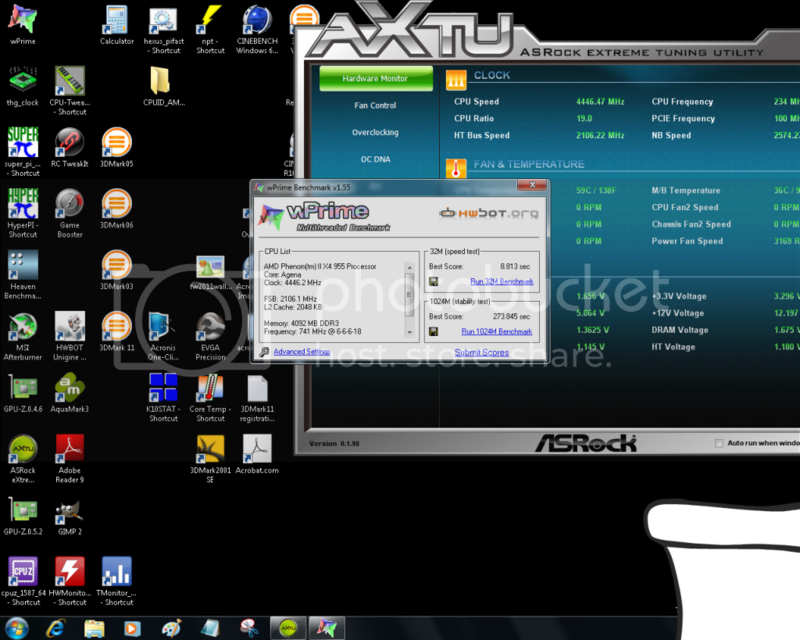 I’ve notice that the vcore as read from the ASRock tuning utility is different from test to test so who knows how much vcore is really going through it. As fair as a cpc comparison can be, just think a balls to the walls max OC would be more relevant given how much higher bulldozer does clock. The deneb must be pretty stretched @ 4.5 on water. how far in MHz that FX4100 should go to have same score as 955BE ? But at lower core counts the phenom II is still the way to go, no way to deny that. 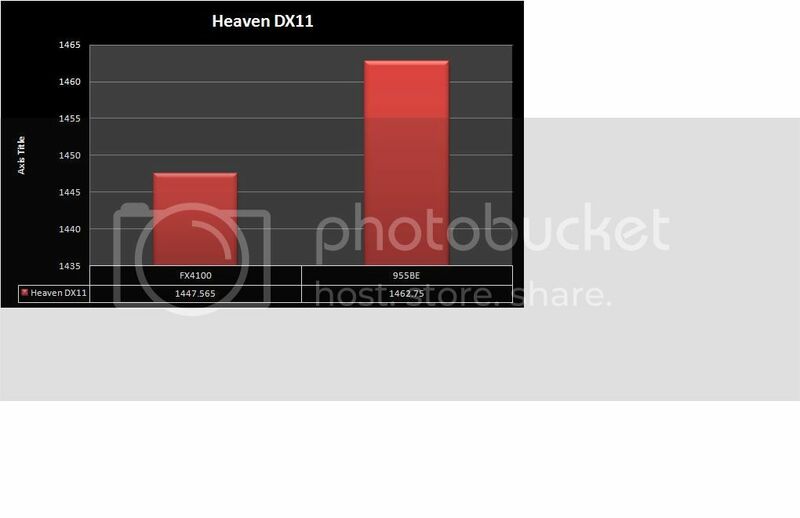 Terrible results for the FX-4100, even the 2 year old 955 still outperforms FX-4100. 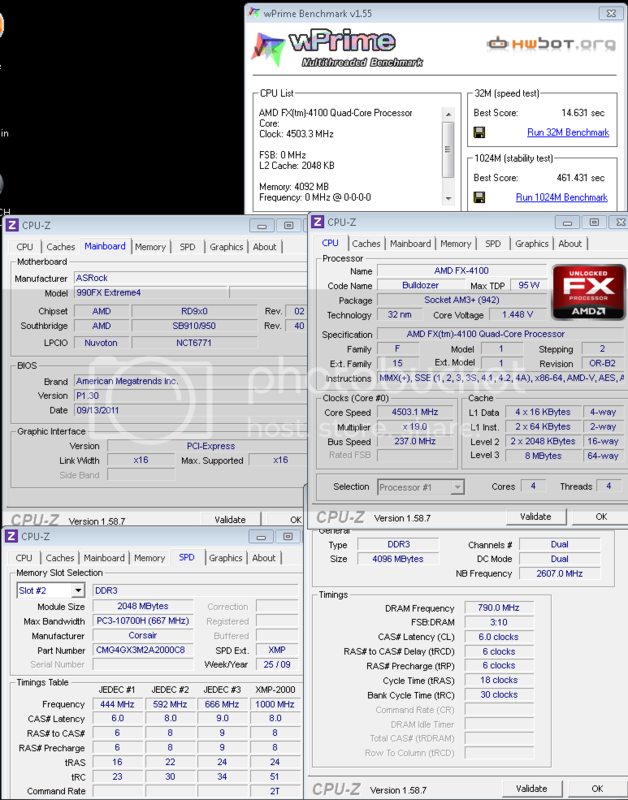 AMD really messed up with Bulldozer, its like Phenom 1 again, but at least its a good overclocker but whats the point if its performance is poor? Could you do some cpu-limited games? And measure power consumption? All things point to rather unfinished product. It kind of looks like 45nm BD they scrapped . The 32nm BD that was supposed to have higher IPC somehow ended up with much lower IPC and clock ceiling of 3.6Ghz on rather problematic 32nm process from GloFo. 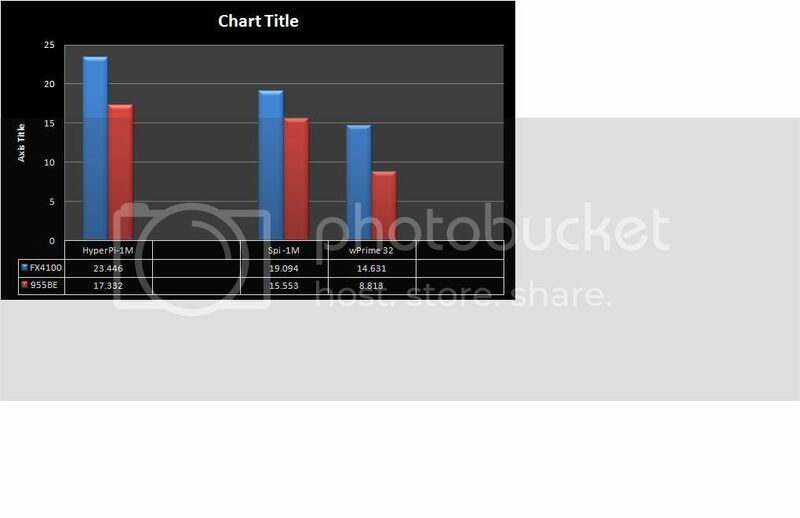 Who knows what kind of "fixing" AMD had to do in order to get BD out of the door in this form (What can cost you 15-25% in IPC? cache latencies,instruction latencies, prefetch disabled,branch predictors not performing as projected,front end problems etc.). We can hope that Piledriver and other succeeding cores will have all the bells and whistles working as AMD intended for this first 32nm Bulldozer. 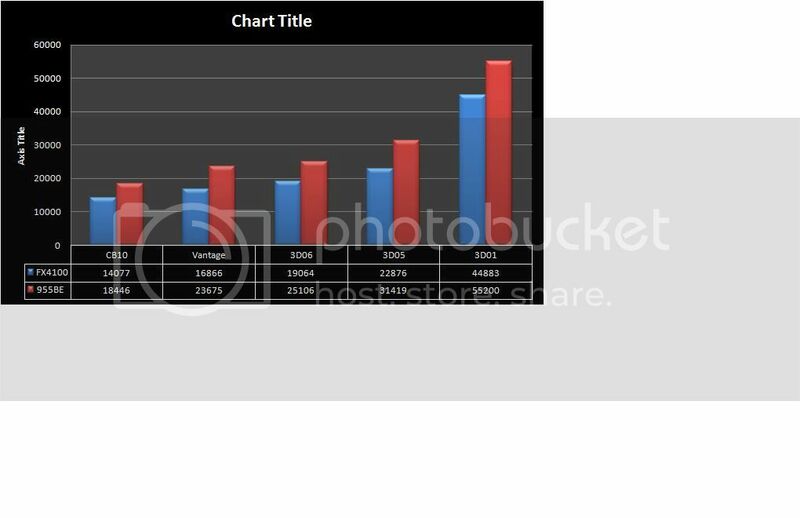 But on a brighter side,AMD needs just to lower the price on FX4000 series and tweak with GloFo a process a little more . If they would have made a native 2 module die it would probably be having a bit more clock headroom,but this separate die approach costs more money of course. 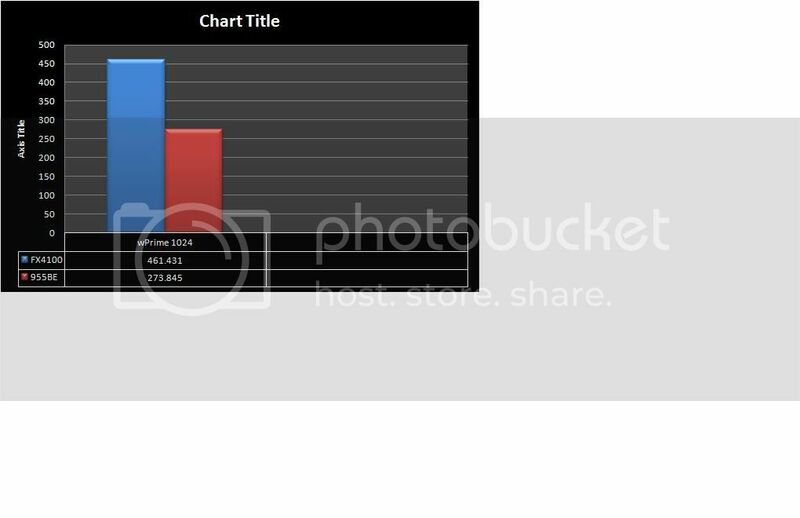 Last edited by informal; 10-21-2011 at 03:49 AM. Right now I'm retesting the 955Be @ default clocks to see how that compares to the FX4100 @4.5GHz and then Iâ€™ll swap out the 955 for the FX4100 and beat on it some. The 955 doesnâ€™t have much more left in it beyond 4446MHz as far as overclocking under ambient water cooling in the case at least not for the heavy tests @full load 4 cores so clocking it down to compare is about all I can do at the moment.